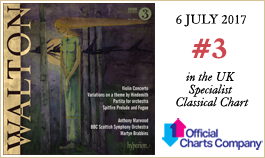 Martyn Brabbins and the BBC Scottish Symphony Orchestra follow up their definitive account of the symphonies (on CDA67794) with another outstanding album of Walton. From the sunlit Mediterranean lyricism of the Violin Concerto to the rousing Spitfire Prelude and Fugue, this is the composer at the height of his power. Of those British composers who followed the examples of Parry (born in 1847), Stanford (1852) and Elgar (1857) in establishing a national musical identity, none made a greater or more lasting impact as a young man than William Walton. A remarkable aspect of his early success was that he was almost entirely self-taught; he never studied at music college (he gained a scholarship to Oxford University at sixteen, but failed to complete his degree), nor was he a performing musician (other than conducting his own music). It was Parry who, in 1918 (the last year of his life), commended the sixteen-year-old’s piano quartet with the words ‘keep an eye on him’. On coming down from university, his education incomplete, Walton was taken up by the Sitwell siblings, moving to London and cohabiting with them and thereby finding himself at the epicentre of immediate post-War art. Walton thus unwittingly became one of his generation’s ‘Bright Young Things’, which the Sitwells in many ways personified: intent upon establishing themselves, they hoped their adopted family member would provide the musical equivalent to their literary aspiration. The quartet so impressed Alban Berg that he took Walton to meet Schoenberg (this before Façade had been performed in public). Parry had been right, but Walton abandoned the atonal path. He was to withdraw the string quartet (though not the ealier piano quartet, which was published in 1924 after having been mislaid for a few years). Walton had met other significant figures at the Salzburg premiere of the string quartet, including the composer, conductor, violinist and violist Paul Hindemith, then twenty-eight, seven years Walton’s senior, their first meeting beginning a forty-year friendship. In withdrawing the string quartet, Walton returned to the roots exemplified in the piano quartet: a command of rhythmic pulse over quite long stretches, a harmonic knowledge unafraid to embrace the non-traditional for expressive purposes, and an inherent lyricism that the more acerbic string quartet hid. Clearly, Walton was a name to watch, and not from Parry’s urging, or from the interest of Berg, Schoenberg, Scherchen or Hindemith. Walton in 1926 was only twenty-four when his brilliant overture Portsmouth Point made a considerable impression. Its first performance was in Zürich under Volkmar Andreae and was followed by one in London under Eugène Goossens. Two years later, Walton’s Sinfonia concertante for piano and orchestra was premiered in London at a Royal Philharmonic Society concert; York Bowen was the soloist, with Ernest Ansermet conducting. Eugène Goossens (Sir Thomas Beecham’s one-time protégé) introduced Walton to Beecham, who suggested he write a viola concerto for Lionel Tertis, a challenge that tapped Walton’s natural lyricism. Tertis, however, rejected the concerto (Hindemith gave the premiere), yet soon regretted his haste, becoming a much-admired performer of the work many regard as the greatest viola concerto ever written. Walton was now someone to encourage—as the newly constituted BBC underlined in commissioning the choral work which was to become the oratorio Belshazzar’s Feast, premiered under Malcolm Sargent at the 1931 Leeds Festival. Beecham took a hand in this, also, suggesting that Walton ‘throw in a couple of brass bands’ in the heftiest passages—which he did. The impact of Belshazzar’s Feast, coming hard on the heels of the viola concerto, made the news that Walton was working on a symphony an enticing prospect, but as the symphony was not ready for the advertised premiere Walton permitted its three completed movements to be performed in December 1934 by the LSO under Hamilton Harty. In the USA, on Christmas Eve 1934, Jascha Heifetz recorded Sibelius’s violin concerto in fractious sessions with the Philadelphia Orchestra under Leopold Stokowski. This was the only time violinist and conductor ever met, a fraught occasion witnessed by Sergei Rachmaninov who was waiting patiently to record his new Rhapsody on a theme of Paganini after the Sibelius. Heifetz forbade release of the concerto recording with Stokowski, and, almost a year later, on 26 November 1935, he re-recorded the work in London with Beecham and the LPO. By that time, Walton’s major works had been heard several times in America—Stokowski had given three performances of Belshazzar’s Feast in Philadelphia in January 1934. The concert news in London in November 1935 was dominated by the first complete performance of Walton’s symphony; Harty conducted the now-complete four-movement work with the BBC Symphony Orchestra, three weeks before Heifetz’s Sibelius sessions with Beecham. Whilst in London, Heifetz took Walton to lunch at the old Berkeley Hotel in Mayfair, a restaurant noted for its hand-painted wallpaper. It was a popular eating-place for musicians (here, dining in the summer of 1933, Elgar had told Fred Gaisberg and Harriet Cohen that his Symphony No 3 was ‘finished’). Over lunch, Heifetz commissioned a violin concerto from Walton—a remarkable tribute to the composer’s stature at that time. Walton was to take his time over the concerto, not beginning serious work on it until early 1938, and much of it was written in Italy where he was convalescing after a hernia operation. The structure of the Violin Concerto in B minor follows that of the earlier viola concerto (in turn, influenced by Prokofiev’s first violin concerto—Walton had been present at the British premiere by Szigeti in 1925) and there is also a subtle quote in the finale from the Sibelius concerto Heifetz had been recording with Beecham when he commissioned it. The violin concerto shows Walton at the height of his powers: the solo part, as edited by Heifetz, could be by no other composer and the orchestration is masterly. Heifetz was thrilled by the work and premiered it in Cleveland with Artur Rodziński on 7 December 1939. But by then war had broken out in Europe and Walton could not be present; he conducted the British premiere in November 1941 with Henry Holst as soloist. Two years later he slightly revised the orchestration. The prelude emanates from the film’s title music, the fugue accompanying the construction of the prototype Spitfire and evoking, as Mark Doran writes, ‘the “one part added to another part, added to another part …” aspect of an aircraft’s assembly … [as well as] depicting the single-minded pursuit of a complex task’. As with Crown Imperial, the Spitfire Prelude and Fugue exhibits Walton’s ‘popular’ touch. The piece, with connotations of wartime victory, was championed in America by Stokowski, who conducted three performances in New York. Also in the United States, for its fiftieth anniversary in 1940, the Chicago Symphony Orchestra had commissioned Walton’s comedy overture Scapino, soon recorded by the orchestra under its conductor Frederick Stock. 1941 saw the violin concerto recorded for the first time by Heifetz with the Cincinnati Symphony under Eugène Goossens. Another American-based conductor, George Szell, was a long-time admirer of Walton—having given the Australian premiere of the Symphony in 1940—and in Cleveland (where he had inherited Artur Rodziński’s baton from Erich Leinsdorf in 1946) Szell’s later recordings of Walton’s music made a considerable impact. For their fortieth anniversary, in 1958, the Cleveland Orchestra commissioned a new work from Walton. The resultant Partita for orchestra, intended to ‘be enjoyed straight off’ as Walton explained, is in three movements, the titles of which reinforce the composer’s love of the Mediterranean (where, on the island of Ischia, he eventually made his home after his whirlwind marriage in 1949). 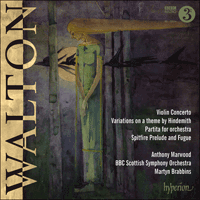 Walton’s Partita is a virtuosic and wide-ranging score, from the dazzling tuttis in the first movement and finale to the languorous central siciliana—opening with a duet for oboe and viola before expanding into one of the composer’s finest soundscapes with virtually pointilliste instrumentation. The brilliance of the outer movements crowns the Partita’s finale with a memorable tune on first trumpet, releasing the tension and heralding the closing section in a mood of triumphant good humour, the E major ending of the Spitfire Prelude and Fugue infusing the Partita throughout. Following the premiere of Walton’s large-scale opera Troilus and Cressida at Covent Garden in 1954, the Partita was one of several orchestral works written between 1956 and 1963: the Johannesburg Festival Overture, the cello concerto, the second symphony and the Variations on a theme of Hindemith. The variations were commissioned by the Royal Philharmonic Society, marking their 150th anniversary in 1963. The work fused a number of strands and formed one of Walton’s finest orchestral scores, but one whose subtleties doubtless led to it being misunderstood when it appeared, the composer’s familiar language in certain quarters now being considered somewhat passé. The forty-year friendship between Walton and Hindemith culminated in this deeply felt homage from one great composer to another, made more poignant as Hindemith was to die suddenly at the very end of 1963, yet not before he had heard the variations and planned to conduct the work, which is dedicated to him and his wife. The theme comes from the opening passage, including harmony, of the slow movement of Hindemith’s 1940 cello concerto. The resultant variations form arguably Walton’s most refined masterpiece, its expression not invariably discernible on the surface. The mastery demonstrated throughout is deeply impressive: here is control of structure, of pace, of emotional content, and an artistic maturity of expression without a bar’s exaggeration. Hindemith’s theme is a note-row (eleven notes, the ‘missing’ twelfth—E flat—is heard in passing). Although nine variations are specified, the work has eleven continuous sections (including finale and coda) after the opening theme, of which the seventh, lento, quotes directly from Hindemith’s opera Mathis der Maler. Walton appears at times to absorb Hindemith’s own distinctive language before reverting to his own—implying an unspoken conversation between friends. Nothing is overdone, each distinctive variation naturally following from what preceded it: a profound tribute indeed to a lifetime colleague and to the Royal Philharmonic Society of London. Not every commissioned work results in a masterpiece, but one was certainly forthcoming on this occasion.